This coming Sunday will be, aside from January 27, the Third Sunday after Epiphany (Epiphany 3). It is also the Commemoration of John Chrysostom, Preacher. We will remember him in our prayers, but I thought you might like to know a bit more about him as he is no longer a household name. First, Chrysostom was not John’s last name. It is a nickname. It is Greek for “golden-mouthed.” That is what first his parishioners called him because they liked his sermons so much. Soon everyone else also called John “Chrysostom.” St. John Chrysostom was a dominant force in the fourth-century Christian Church. Born in Antioch around 347 AD, John was instructed in the Christian faith by his pious mother, Anthusa. After serving in a number of Christian offices, including acolyte and lector, John was ordained a presbyter and given preaching responsibilities. His simple but direct messages found an audience well beyond his hometown. In 395 AD, John was made patriarch of Constantinople. His determination to reform the church court and city brought him into conflict with established authorities. Eventually he was exiled from his adopted city. Although removed from his parishes and people, he continued writing and preaching until the time of his death in 407 AD. It is reported that his final words were “Glory be to God for all things! Amen.” His life can remind us that following Jesus does not automatically mean an easy or prosperous life, even in a “Christian” setting. Following Christ has a price; a price believers are willing to pay. 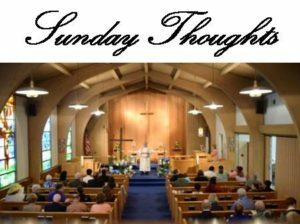 Turning out thoughts now to this coming Sunday, the appointed readings are: Nehemiah 8:1–3, 5–6, 8–10; Psalm 19:1-14 (14); 1 Corinthians 12:12–31a; Luke 4:16–30. We will be using Divine Service, setting one (LSB 151), configured as a Service of the Word. The sermon will be titled “Thy Strong Word.” The text will be Psalm 19:7. Our Opening Hymn will be, “O Christ, Our True and Only Light” (LSB 839). Our Sermon Hymn will be “Thy Strong Word” (LSB 578). Our Closing Hymn will be “O Word of God Incarnate” (LSB 523). Below you will find some initial thoughts on the lessons, but you will easily see the big theme is the Word of God. Initial Thoughts: You might notice that verse 14 is used by many pastors at the beginning of their sermon. It is a most appropriate prayer at that time. The words, “To the choirmaster. A Psalm of David” are in brackets. They will be omitted during the worship service, though part of the original text. They tell us the author of the Psalm and that it was intended for use in a worship service. The entire Psalm is about the Word of God, but we discover the concept is much broader than the Bible. The first six verses depict creation as proclaiming the glory of God across the entire world, but that people ignore it. So it remains true today. People still explain creation in ways that exclude God. It is not reasonable, but reason is often not humanities long-suite. Verses seven through ten, using synonyms like “law of the LORD,” “testimony of the LORD,” “precepts of the LORD,” and “commandment of the Lord,” speak of the word in more conventional ways, that is, the Bible, good preaching, good hymns, etc. As we think of this text we should always remember the Jesus is “The Word,” and so all proper understandings of text should reflect Jesus. So, what does nature proclaim? Jesus is Lord of all creation. What does the “testimony” “precepts,” etc of God teach? Jesus forgives our sins and therefore “revives our souls,” “makes us wise” unto salvation, “enlightens our eyes,” and “rejoices our hearts.” Jesus is sweeter than honey. Jesus is to be desired more than much gold, etc. Starting in verse eleven, David turns to personal application. He recognizes his sinfulness. In fact, he (like us) is not even aware of all his sins. Yet forgiveness is found in the declaration of grace (Justification). We are, like David, to follow our Lord Jesus, revealed in the word. 8:1 And all the people gathered as one man into the square before the Water Gate. And they told Ezra the scribe to bring the Book of the Law of Moses that the LORD had commanded Israel. 2So Ezra the priest brought the Law before the assembly, both men and women and all who could understand what they heard, on the first day of the seventh month. 3And he read from it facing the square before the Water Gate from early morning until midday, in the presence of the men and the women and those who could understand. And the ears of all the people were attentive to the Book of the Law. [4And Ezra the scribe stood on a wooden platform that they had made for the purpose. And beside him stood Mattithiah, Shema, Anaiah, Uriah, Hilkiah, and Maaseiah on his right hand, and Pedaiah, Mishael, Malchijah, Hashum, Hashbaddanah, Zechariah, and Meshullam on his left hand.] 5And Ezra opened the book in the sight of all the people, for he was above all the people, and as he opened it all the people stood. 6And Ezra blessed the LORD, the great God, and all the people answered, “Amen, Amen,” lifting up their hands. And they bowed their heads and worshiped the LORD with their faces to the ground. [7Also Jeshua, Bani, Sherebiah, Jamin, Akkub, Shabbethai, Hodiah, Maaseiah, Kelita, Azariah, Jozabad, Hanan, Pelaiah, the Levites, helped the people to understand the Law, while the people remained in their places.] 8They read from the book, from the Law of God, clearly, and they gave the sense, so that the people understood the reading. Initial Thoughts: On Sunday verses 4 and 7 are omitted from the reading. They are included above in brackets. If you look at them now, you will understand why they are left out. Every reader this coming Sunday will appreciate the omission. The account is from when the Jews returned from their Babylonian Captivity, which happened in 358 BC. Babylon first defeated Judah and deported the Jews. Then Babylon was defeated by the Persians and Cyrus let the Jews return to their homeland. The occasion for the celebration was the completing of the city walls and marks the establishment of the “festival of booths” (or “tabernacles’). Today the Jews call it “Sukkot.” We find Jesus celebrating this festival in John 7 where he teaches in the temple. The teaching we see in our OT reading points forward to Jesus, the Word in Flesh, teaching in the Temple. We also get a familiar feeling from the worship service in our reading. The word of God is read and explained. The congregation responds with appropriate liturgical words. Then the people participate in a meal. All this points forward to our “word and sacrament” services. In general, it is appropriate to see all “meals” in the OT as indicators of the Lord’s Supper, especially those related to worship. When we receive communion, there is no reason to “be grieved, for the joy of the LORD is your strength.“ We are forgiven! 12 For just as the body is one and has many members, and all the members of the body, though many, are one body, so it is with Christ. 13For in one Spirit we were all baptized into one body—Jews or Greeks, slaves or free—and all were made to drink of one Spirit. 14 For the body does not consist of one member but of many. 15If the foot should say, “Because I am not a hand, I do not belong to the body,” that would not make it any less a part of the body. 16And if the ear should say, “Because I am not an eye, I do not belong to the body,” that would not make it any less a part of the body. 17If the whole body were an eye, where would be the sense of hearing? If the whole body were an ear, where would be the sense of smell? 18But as it is, God arranged the members in the body, each one of them, as he chose. 19If all were a single member, where would the body be? 20As it is, there are many parts, yet one body. 21 The eye cannot say to the hand, “I have no need of you,” nor again the head to the feet, “I have no need of you.” 22On the contrary, the parts of the body that seem to be weaker are indispensable, 23and on those parts of the body that we think less honorable we bestow the greater honor, and our unpresentable parts are treated with greater modesty, 24which our more presentable parts do not require. But God has so composed the body, giving greater honor to the part that lacked it, 25that there may be no division in the body, but that the members may have the same care for one another. 26If one member suffers, all suffer together; if one member is honored, all rejoice together. 27 Now you are the body of Christ and individually members of it. 28And God has appointed in the church first apostles, second prophets, third teachers, then miracles, then gifts of healing, helping, administrating, and various kinds of tongues. 29Are all apostles? Are all prophets? Are all teachers? Do all work miracles? 30Do all possess gifts of healing? Do all speak with tongues? Do all interpret? 31But earnestly desire the higher gifts. Initial Thoughts: Once again, a few words are omitted, this time from the final verse. I feel these words should have been the opening words of chapter 13 but they are included in the brackets. This reading is part of a continuous reading through 1 Corinthians and so does not as easily dovetail with the other lections. However, as they are all ultimately about Jesus, they are connected. For example, baptism is a “washing of water with the word” (Ephesians 5:26), and the other lessons are about that word. This “Word” is Christ, and we are joined to Christ. This reading is about how we are the “body of Christ.” Notice how baptism is spoken of. While there is certainly symbolic elements in Baptism, Paul speaks of what Baptism does, not what it symbolizes. As we have all received the same Baptism, we are all made part of the one Body of Christ, no matter where we come from. We all, also, have value based on our baptism. Today people spend a lot of time seeking their identity. We need look no further than our baptism. We are children of God, members of the body of Christ, and his ambassadors. We are forgiven sinners, as David spoke of in our Psalm. Some may have more public roles, but that doesn’t make them more important. As the Super Bowl is coming up, we might think of it this way. The two quarterbacks may get more press than the centers, but if no one hikes the ball, or if the center can’t hike the ball cleanly to the quarterback, all the skills of the quarterback will not help the team win the game. All members of the Body of Christ have their role to play. Paul uses a body metaphor instead of a football team, but his point is the same. 20 And he rolled up the scroll and gave it back to the attendant and sat down. And the eyes of all in the synagogue were fixed on him. 21And he began to say to them, “Today this Scripture has been fulfilled in your hearing.” 22And all spoke well of him and marveled at the gracious words that were coming from his mouth. And they said, “Is not this Joseph’s son?” 23And he said to them, “Doubtless you will quote to me this proverb, ‘“Physician, heal yourself.” What we have heard you did at Capernaum, do here in your hometown as well.’” 24And he said, “Truly, I say to you, no prophet is acceptable in his hometown. 25But in truth, I tell you, there were many widows in Israel in the days of Elijah, when the heavens were shut up three years and six months, and a great famine came over all the land, 26and Elijah was sent to none of them but only to Zarephath, in the land of Sidon, to a woman who was a widow. 27And there were many lepers in Israel in the time of the prophet Elisha, and none of them was cleansed, but only Naaman the Syrian.” 28When they heard these things, all in the synagogue were filled with wrath. 29And they rose up and drove him out of the town and brought him to the brow of the hill on which their town was built, so that they could throw him down the cliff. 30But passing through their midst, he went away. Initial Thoughts: As most everyone knows who might read this, I have just returned from a vacation in Israel. I was told by other pastors that the trip would change how I read the Bible. I wasn’t sure how. After all, I know the Bible is about Jesus and that wasn’t going to change. Well, I now know what they meant. As I read this coming Sunday’s Gospel lesson I was suddenly transported in my mind to the very site where these events happened. I saw, with my own eyes, the cliff the citizens of Nazareth wanted to throw Jesus off. This doesn’t change the meaning of the text or my understanding of it, but it does make it more personal and dramatic. At any rate, the account takes place very early in the public ministry of Jesus. He returns to the town he grew-up in and he is the guest preacher in the synagogue, no doubt the one he attended as a child and youth. He basically tells them that the Old Testament is about him and that he is the fulfillment of it and its Gospel hope. The message doesn’t go over well. Nothing new here. The word of God receives one of two responses. The first response is acceptance. The second is rejection. The rejection might be mild but often, as is the case here, ardent and even violent. Both the human and divine natures of Jesus are on display. We might also say that the word about Jesus is spreading as the people of Nazareth have heard reports concerning Jesus. Word of mouth is still one of the best ways to communicate Jesus. We can remember that sharing the truth is no guarantee that the truth will be welcomed. Many give the false impression that the effectiveness of the Gospel depends on us, on how we share it. It does not. If it did, then how did Jesus go wrong? Our confessions have it right, “For through the Word and the sacraments as through instruments the Holy Spirit is given, who effects faith where and when it pleases God in those who hear the Gospel” (Augsburg Confession, Article Five). The Holy Spirit worked faith in the hearts of his Apostles, but due to the hardness of the hearts of the people of Nazareth he did not work faith in them. The same “word” is used both times by Jesus. Well, I’m sure you know that I could keep going, but you will have to come and worship with us Sunday to hear more. Have a great week.